Basic metric size retaining snap rings per. ANSI B27.7 size chart. Includes Ring and groove design data, groove dimensional and tolerance information. Retaining snap ring is a fastener that holds components or assemblies onto a shaft or in a housing/bore when installed in a groove. Once installed, the exposed portion acts as a shoulder which retains the specific component or assembly. Circlips are a type of retaining ring. All dimensions are in millimeters. Sizes −4, −5, and −6 are available in beryllium copper only. These rings are designated by series symbol and shaft diameter, thus: for a 4 mm diameter shaft, 3AM1-4; for a 20 mm diameter shaft, 3AM1-20; etc. Ring Free Diameter Tolerances: For ring sizes −4 through −6, +0.05, −0.10 mm; for sizes −7 through −12, +0.05, −0.15 mm; for sizes −13 through − 26, +0.15, −0.25 mm; for sizes −27 through −38, +0.25, −0.40 mm; for sizes −40 through −50, +0.35, −0.50 mm; for sizes −52 through −62, +0.35, −0.65 mm; and for sizes −65 through −100, +0.50, −0.75 mm. Groove Diameter Tolerances: For ring sizes −4 through −6, −0.08 mm; for sizes −7 through −10, − mm; for sizes −11 through −15, −0.12 mm; for sizes −16 through −26, −0.15 mm; for sizes −27 through − 36, −0.20 mm; for sizes −38 through −55, −0.30 mm; and for sizes −57 through −100, 0.40 mm. Groove Diameter F.I.M. (full indicator movement) or maximum allowable deviation of concentricity between groove and shaft: For ring sizes −4 through −6, 0.03 mm; for ring sizes −7 through − 12, 0.05 mm; for sizes −13 through −28, 0.10 mm; for sizes −30 through −55, 0.15 mm; and for sizes −57 through − 00, 0.20 mm. 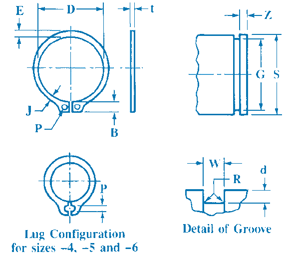 Groove Width Tolerances: For ring size −4, +0.05 mm; for sizes −5 and −6, +0.10 mm, for sizes − 7 through −38, +0.15 mm; and for sizes −40 through − 100, +0.20 mm. 0.1 mm; for sizes −19 through −30, 0.2 mm; for sizes −32 through −50, 0.3 mm; and for sizes −52 through −100, 0.4 mm.